It's bedtime for me but invoice away and I'll get on it tomorrow after work! order invoice mail do not arrived. why not ? Man just chill out and be patient. So rude! I just stepped away for dinner. I'll finish invoicing by EoD today. I'm 1/3rd of the way through and will post when I'm completely done. Also check the 'More' section to see my progress on the original post. 69/137 Orders invoiced. Should be doing in the next 90min. There may have been a few that I mis-identified as Domestic or International. If that's the case, just let me know and I'll adjust the invoice before you pay. If I missed anyone just let me know, as well. There were a few duplicate submissions that I did not catch and there are 10 available sets if anyone missed the initial purchase. Now's the time to jump in on the group buy. stoked for this! thanks for putting this together! Hi MaNiFeX. Please check out my pm. Thanks. OK, off to bed for me. Give me 8-9 hours of sleep and getting to work. I'll check on this around 9am PST. Thanks! You have invoiced me $107.5, will you invoice me $100 later or $207.5 instead? Hi MaNiFeX. Please check mail. thanks.! Got it taken care of. Thanks! Thank you all for paying promptly! As of now, we are teetering around the MOQ after a group of people cancelled their order. If you would like a set and are not part of the group buy, yet, please PM me for a slot. I'm working on updating the status of each order on the main page, but I am still processing who's paid and dropped out. Should have that done tonight or tomorrow. As always, if there's an immediate issue, feel free to PM me! Thanks All! Bummer! I may have to front cash to fill MOQ, and may have some extras afterwards. Payed the invoice. Check PM please though. Cheers. Due to too many cancellations, we are down to just MOQ. I can't take any more cancellations until I've gone through all the payments and make sure the group buy is viable. This wasn't an interest check, people. I have my own funds riding on this buy. Please do not join group buys unless you intend on following through with the purchase. Thank You. I'm at work right now, but will be working on confirming and posting who's paid over lunch and after dinner tonight. We are more than halfway through payments, so thank you all who have paid so promptly. I'm a single father of two daughters, so I also thank those of you have been patient with me with my responses. I am in communication with Christopher at GMK regularly, and he's waiting on a final number. 165 people signed up, but due to all the cancellations, I may not be able to afford to have all 165 sets made. We may have only 150 made, which means this will be quite a special set for all those that get them! Thanks all for your support, it's exciting to be running a group buy and I can't wait to send these sets out to you all! Once all invoices are paid, I will be doing the drawing for the NovaTouch. Thank you for your hard work! I can't believe people think this is an IC! To be honest, I should have had shorter period to join... It's my first buy, so 'live and learn.' I've received about half of the payments and am ready to make the initial payment to GMK. After that, it's time to wait. I hope I don't have to play repo-man. I've had multiple people cancel their invoices and ask to back out of the group buy. Please don't do this. You've committed to purchasing a set and by backing out you are putting the whole group buy in jeopardy and are putting my personal finances at risk in order to complete the group buy. Backing out at the last minute is not OK. Please don't sign up for a bunch of group buys and then back out of one's that you've signed up for. It's really bad form and is not fair to the rest of the group buy or the organizer. It's not a great time of the month for me, otherwise I would've offered to chip in an additional set. How are we looking for numbers? Can we still make MOQ? Although I agree with you Manifex, this group buy has been open for a lot longer than usual and this means peoples finances can change wildly in that time. If this was open for a month max, then I doubt this would've been an issue. If I can still afford it before you submit the order, then I'd love to however **** happens. Never put your personal finances at risk in a group buy - I've learnt this the hard way and it hasn't been pleasant. Hey MaNiFeX, you invoiced me for domestic shipping but I'm overseas and will need international. Send me a new invoice? I'm #0043. I don't really think this mentality is fair, it's there money and they're allow to do with it as they choose, whether **** happened or not. I know it's annoying when something you want is interrupted or threaten because people change there mind but it's not fair to expect them to pay for something they no longer want or potentially can't afford. Regardless I think this set will be fine. But if the group buy depends on a few people is that really a good group buy model? No, it isn't. My first group buy dropped from 42 to 24, but I was still able to do it. If the group buy was open for two weeks and the leader immediately closed it when the exact amount was met then there is still bound to be a couple that drop out - this effect worsens the longer a group buy goes on. I was prepared to pay the order when I placed my order, however I'm out $630 + £250 at the minute and I know it will get worse if I don't pay these. Set is completely viable at the moment. I'm going through the final payments now and updating my master spreadsheet. As of now, over half have paid and I still have a dozen or so orders to process. I'll post the updated list shortly. As long as everyone who's been invoiced pays, we are set to go right now! OK, updated and resent. Thank you for paying! But if the group buy depends on a few people is that really a good group buy model? No, it isn't. My first group buy dropped from 42 to 24, but I was still able to do it. Due to the minimum order quantity at GMK, I was unable to place a smaller order. It was previously 250 for that company, so I'm very pleased that I'm able to do this at all. I'm doing my best to follow the group buy process as I know it, but I do appreciate the feedback. I will make sure to do a smaller sign up period for my next buy. I appreciate the feedback. I'll keep my next buy period to two weeks to a month, max. As long as people pay for their order, I won't be at risk. GMK has been great to work with. If I continue to run group buys, I'll most likely set up an LLC for the keyboard club I run (PDXKBC) and put out club-based group buys. We're up to about 100 members, so we could easily run one for the club with others from here. Alright! Invoicing details are up on the main page. Thank you all who have paid promptly. Your GB number will remain the same throughout the process from here forwards. 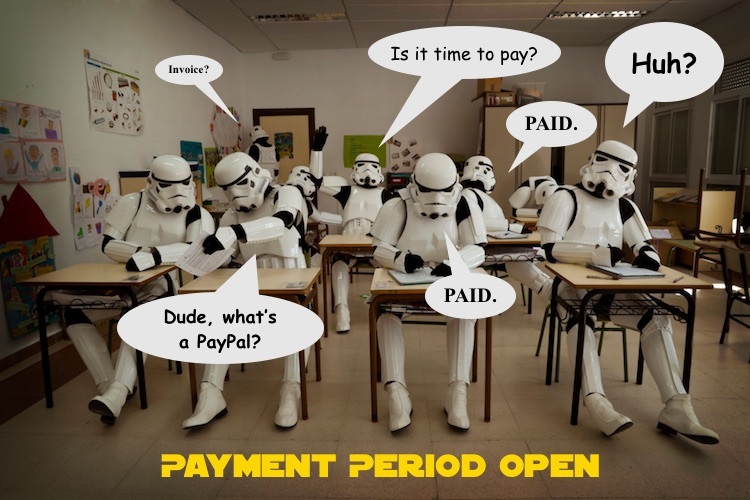 We are about halfway through the payment period and more than half have paid. Thank you! I have received funds and have placed the final order of 150 sets with GMK. Thank you to everyone participating, without your interest and trust, this set would not be made. Paid. Thank you for running this. Thank You! You bet! Updated status. Spoke with GMK. Placed final order number and was given a 12 week production timeline. Will begin transferring funds to them soon. Please pay your invoices promptly. Thank you! Paid up! Thanks for running this GB and shame on ppl reserving orders and jumping off at the last minute. I SOLD MY CARBON SA FOR THIS! Just kidding I was going to sell it anyway. Oh man. I was, like, WOWSERS! You had me there! lol. OK BBST peeps! We're 2/3rds the way paid up. Let's do this. If everyone pays by Monday, I get to do the drawing for the NovaTouch. MUCH HYPE.